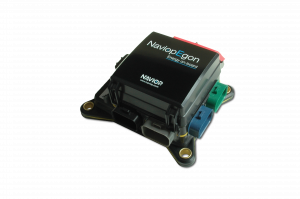 NAVIOP EGON + POWER is the brand new power distribution board able to supply power to the all boat. It enables to eliminate the electrical panel and to manage the lines through a compact and cheap power distribution system. EGON + POWER reduces the cables necessary on a boat, considerably cutting down costs and time of wiring. As a single and cumbersome electrical panel is not necessary anymore, it is possible to delocalize the power distribution system to better use rooms available on-board. The EGON unit communicates over a CAN bus using the SAE J1939 protocol and it is an excellent solution to control and monitor circuits up to 20Amps at 12Vdc or up to 10Amps at 24Vdc. By communicating with other devices on the CAN bus network, it can be part of a multiplexing system in order to eliminate the need of individual connections between switches and loads. EGON + POWER is rated at 200 Amps, with individual outputs 12Vdc or 24Vdc rated up to 30Amps with fuses. EGON + POWER controls relays via direction of J1939 CAN bus and reports every second the status of relays and fuses to the J1939 CAN bus, indicating any blown fuse or failed relay. The unit is equipped with 8 outputs controlled via relays. Relay By-Pass. The EGON + board has 8 inputs to pilot directly relay coils, assuring in this way a by-pass also in emergency conditions (ex. : failure on the CAN BUS line). These inputs can also be used to realize commands out of the board (ex. : via switch). Waterproof to high pressure spraying (IP66). EGON + POWER is designed and manufactured with robust features such as a heavy-duty housing, silicon and Gortex gasketing, and protective conformal coated electronics. Based on proven and patented technology it is suited for the most demanding marine applications.